For more information on the barcode please refer to the Barcoding Plasma Derivative Implementation Guide . Facilitate global compliance and benchmarking. To enable health providers, laboratory information system providers and suppliers/distributors to update their systems and processes, transition labels will be used during the implementation period. During this time, units will be issued by the supplier which contain barcodes in the current symbology (such as Codabar), as well as barcodes in the new symbology. At the conclusion of the implementation period, the transition labelling will cease and units will only contain the new (ie ISBT128 or GS1) barcodes. 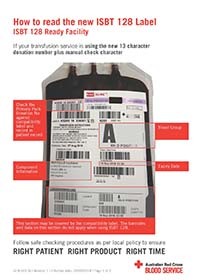 Additionally, the Australian Red Cross Blood Service has produced The Australian guidelines for the labelling of blood components using ISBT128  which provides further detail on the specific implementation of ISBT128. Further, GS1 has produced GS1 General Specifications  that provide the foundations of the GS1 standard that defines how identification keys, data attributes and barcodes must be used in business applications. including labelling of Blood Products GS1 which provides further detail on the specific implementation of GS1. If you require any support in implementing the GS1 standard you can directly contact the GS1 Healthcare team on: 1300 BARCODE (1300 227 263) | healthcareteam@gs1au.org . Samples of barcodes created by suppliers will be uploaded here as they become available. Thank you to all those who attended the Barcoding Reform Open Forum on the 21st of October 2015. Watch the forum below or view the pdf of the presentation. The Barcode specifications  for blood and blood products funded under the National Blood Arrangements approved by the Jurisdictional Blood Committee in September 2014 require the Australian Red Cross Blood Service, as the supplier of fresh blood products, to implement the ISBT 128 DataMatrix. The Australian Red Cross Blood Service (Blood Service) has advised that the implementation of the ISBT 128 labelling standard will be 18 November 2018. Initially, the Blood Service will be implementing a transition label that will consist of both the ISBT 128 barcodes and the existing Codabar barcodes within distinct sections. The transition label will allow facilities that have not yet implemented ISBT 128 capabilities to continue to manage inventory without disruption to supply of blood. 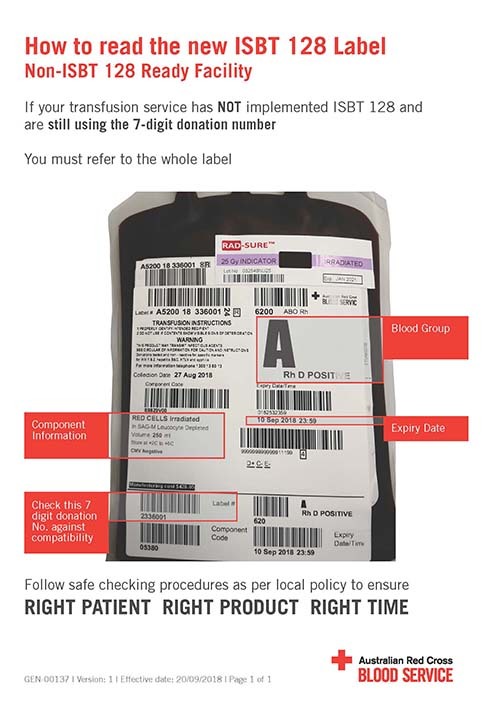 If you require further information please contact the Blood Service on ISBT128enquiries@redcrossblood.org.au  or review The Australian guidelines for the labelling of blood components using ISBT128 . Facilities - an organisation that assigns ISBT 128 DINs, product codes etc. Information regarding licensing and registration fees is available on the ICCBBA website https://www.iccbba.org/registration-licensing/definitions-of-use . 1 January 2018 – suppliers can cease the transition labels. All products supplied must fully comply with the GS1 DataMatrix elements identified in the Barcode specifications for blood and blood products funded under the National Blood Arrangements. As a result of the tender process for imported Immunoglobulin products there will be three new products available. Will be available in four vial sizes; 1g (5mL), 2g (10mL), 4g (20mL) and 10g (50mL). Should be stored below 25°C. Do not freeze. Protect from light. Will be available in five vial sizes; 0.5g (10mL), 2.5g (50mL), 5g (100mL), 10g (200mL) and 20g (400mL). Should be stored below 30°C. Do not freeze. Protect from light. Will be available in three vial sizes; 5g (50mL), 10g (100mL) and 20g (200mL). Will be available in four vial sizes; 5g (50mL), 10g (100mL), 20g (200mL) and 40g (400mL). Quarterly updates will be available from this page and will also be posted to the Machine Readable Product Identification mailing list through BloodPortal . Quarterly webinars will also be scheduled in early 2015. Alternately, please do not hesitate to contact the National Blood Authority by email (barcoding@blood.gov.au ) or by telephone – 13 000 BLOOD (13 000 25663).